Every year our members make quilts to donate to community organisations. This years Community group is Age Concern, which is an organisation that provides help and support for some of the older people in our community. Age Concern work to serve the needs of older people by offering nationally contracted services, education, resources and national leadership. At our May meeting we handed over this years output to Sue Campin of Age Concern, pictured here with her colleague Jenny Barker, our President Jennifer and secretary Juliet. 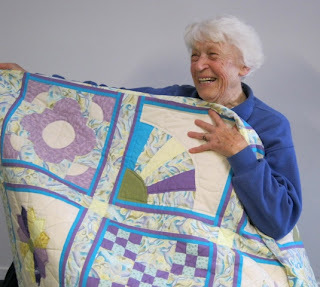 The next day, at the Age Concern office, Agnes, an 81 year old, was invited to choose her favourite quilt to take home. The pleasure on her face is obvious and she was so happy to be the recipient of something beautiful and handmade. Every month we have a community block available for members to take home and make. These are brought back and made in to quilts to hand to our chosen charity during the year. For both beginners and experienced quilters this is a good way to practice our skills and give something back to the community.